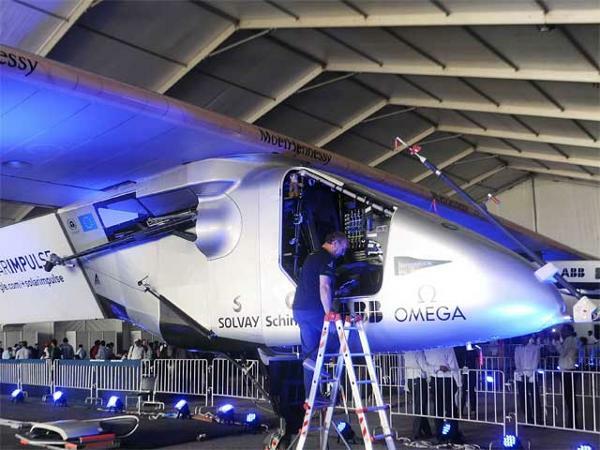 The Solar Impulse -2 is the sole solar powered aircraft is about to undertake the most grueling part of its journey to fly non-stop for six-days from China to Central Pacific. Solar Impulse-2 is in Nanjing city in east China waiting for clearer skies and favorable weather before it will commence its longest nonstop journey to Hawaii in the Central Pacific. The pilots are calling this longest leg of their journey as the ultimate and the moment of truth. The aircraft founder and pilot, Andre Borschberg, will be alone in the cockpit during the nonstop flight. Andre told the BBC that he has been waiting anxiously and working hard to find a window for some weeks now. Solar Impulse till now during the course of his epic round –the-world trip had to do small hops lasting at the most 20 hours. A normal passenger airline can cover the 8000 kilometer journey in just less than 10 hours. However Solar Impulse which solar powered and prop driven could take 5 to 6 days of nonstop days and nights of nonstop flight. The solar powered plane has had stopovers at two Indian cities – Ahmedabad and Varanasi. The plane will be travelling a total of 35,000 kilometers and the whole journey is expected to take five months to complete. The Solar Impulse 2 Solar powered plane’s nonstop flight from China to Hawaii has been postponed due to bad weather. The Solar Impulse 2 is in the midst of a path-breaking circumnavigation effort without utilizing a drop of fossil fuel. Right now Mission controllers at the Monaco Mission Control Center are trying to find the best window for a 5 day and night crossing to Hawaii. Mission controllers have given 4 conditions before a green signal can be given for a takeoff. Best takeoff and landing conditions. The mission began in March 2015 and will be ending on July 2015.